There are no views from the true summit of Merrills Hill located in the Vanderwhacker Mountain Wild Forest of the central Adirondacks. An unofficial trail takes you to open ledges on the western side of the hill that offer spectacular views to the west. This is one of those unknown gems located in the Adirondacks. We found this gem from the Off On Adventure blog. Below is some info about this great hike. Directions: From North Creek, take NY 28N north over the Hudson River and out of town. Soon after crossing into Essex County, turn right onto County Route 34 aka Main Street. After going through the small hamlet of Olmstedville, this road becomes Trout Brook Road. Turn right onto Wamsley Road and follow the road as it turns into a dirt road until the end. Park at the end of the road. The abandoned section of road continues as a snowmobile trail. The GPS coordinates are N43 47.727 W73 51.971 for those who have a GPS devise. Follow the abandoned section of road, which is a marked snowmobile trail. 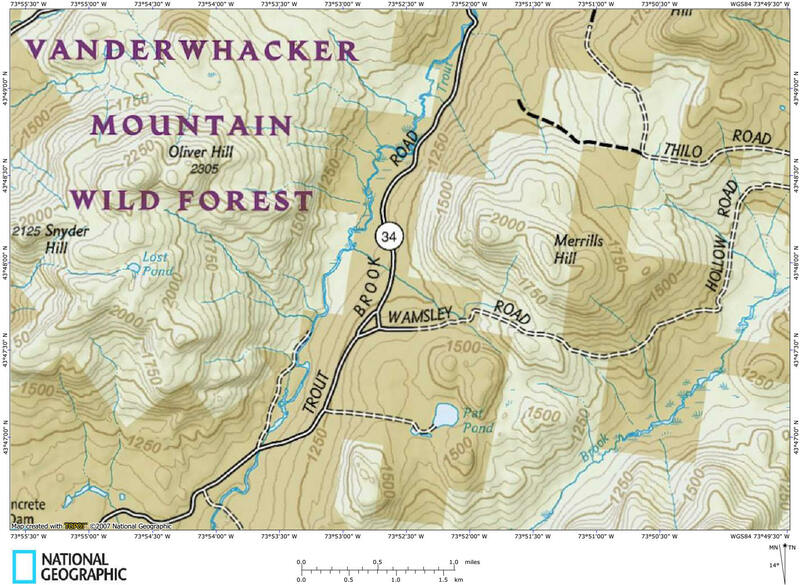 Soon you will enter the state lands of Vanderwhacker Mountain Wild Forest. It is near the state land signs where you'll find the unofficial path on your left. The path has orange ribbons and some blue discs. You can follow it up to the open ledges on the western side of this hill. The ledges have major drop offs, so care should be taken near the edges. This hike is officially a bushwhack although it does follow a herd path that is marked. This path is not a trail that has been officially designated by the NY DEC.